Two mistakes by West Brom caused Everton to clinch a 2-0 win, their first of the season after four games. 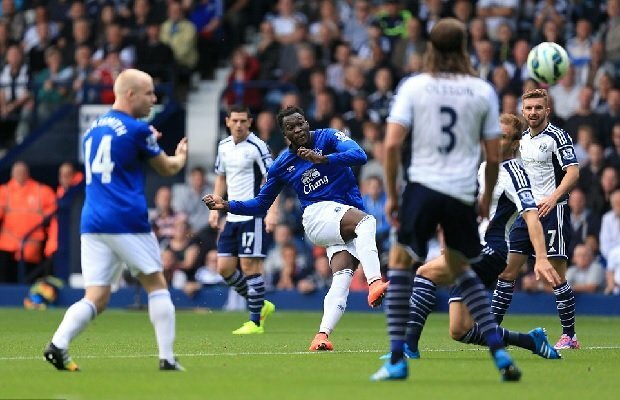 Former Baggies loanee Romelu Lukaku put Everton ahead 2 minutes into the game with a sublime effort which curled round into the bottom corner, away from the tips of Ben Foster. Kevin Mirallas popped up later on in the game to put Everton’s first 3 points on the board and their first clean sheet, after conceding 10 goals in the opening three matches. Within the first two minutes, Sweden and Baggies defender Jonas Olsson, made a poor clearance to the edge of the box which teed it up nicely for Lukaku to curl around Ben Foster. West Brom did show rare signs of scoring, but Everton looked too comfortable as they secured their first clean sheet of the season when on the 66th minute, Kevin Mirallas fired a shot which seemed ambitious, towards goal and somehow, it rolled under the body of Ben Foster, who looked like to have the shot covered. Albion searched for some closure through youngster Saido Berahino’s effort, which was deflected over. There were also signs of a good link up between Berahino and new signing Brown Ideye. However, the Baggies lacked in quality to show signs of even threatening Everton. Samaras and Blanco made their debuts for West Brom yesterday afternoon but had no impact on the game despite Samaras having an effort towards the end of the game, he was denied consolation by comfortable Everton stopper Tim Howard. Can Arsenal win the Europa League?